Stefano Casalotti, Jean Dollimore, Meade McCloughan, James Brander, Christine Bryce joined the second inspection ride on 16th April. We started on a high note with a ride up the Broadwalk which is now officially open for cycling. Since progress from the Broadwalk into Primrose Hill is impeded by the narrowness of Albert Bridge and the one way system in St Marks Square and Albert Terrace, we stopped there. Regarding the bridge, we have heard from Colin Wing (Westminster Cyclists) that Royal Parks are applying for Greenways funding to investigate allowing cycling across St Mark’s Bridge. St Mark’s Square (see photo on the left) has three southbound lanes and is clearly wide enough for two way working either for all vehicles or for cyclists. Similar arguments can be made for the northbound Albert Terrace. We have already asked Camden council for two-way cycling in St Marks Square over a period of several years. Maybe if the bridge is done, it will provide an incentive. After inspecting both ends of this little gyratory, we moved on to a happier note with a ride along Princess Road, in which two-way cycling has recently been made available. 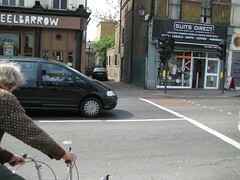 This scheme uses a lightweight approach with signs at each end (see the photo on left for signs warning motorists of contraflow cyclists) and logos in the road. We were surprised and very pleased to see that No entry signs with “except cycle’ subplates have been used instead of the difficult to understand “flying motor cycle” signs. (See the photo on the right. It seems that at last, these signs are permitted by DfT but have to be applied for. The towpath provides an excellent long distance peaceful route for cyclists on east-west routes, for example it provides a good routes to Paddington Station and to the east end of London from Camden Town. 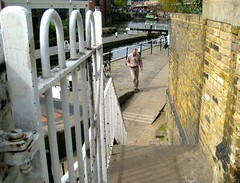 However, the area around Camden lock is very crowded at times and a bypass is needed. There already is a good ramp down to the canal from Gloucester Avenue, but it isn’t possible to ride east from Gloucester Avenue parallel to the canal as the railway gets in the way. Therefore a suitable access point is required at Oval Road. We rode on the canal towpath between Gloucester Avenue and Oval Road. The current access at Oval Road is via steep steps shown in the photo on the left. Meade explained the solution proposed in a Green CRISP report last autumn. The proposal is to build a gentle ramp crossing the bridge and then running down over the steps and along the wall. We inspected the proposed bypass route along Jamestown Road and Hawley Crescent. The latter needs to be made two way for cycling. This is a minimum requirement for the bypass to work at all. The idea has been mooted with Camden Council for about four years. We are optimistic that the new cycle hire station proposed for Hawley Crescent may spur this on a bit. Such a bypass route needs an exit on to Kentish Town Road where there currently is another flight of steep steps (see photo on right). Not quite so bad as those at Oval Road, but still a challenge to bikes and buggies. In this location there is a vacant lot beside the steps which could easily be used for an excellent pedestrian and cycle entrance. 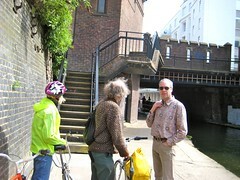 We rode on the towpath from Kentish Town Road to Royal College Street. The access point at Royal College Street is excellent: a long ramp that is easy to ride up. It could be argued that a bypass route should end there, (using Camden gardens and Bonny Street) but that would require the ability to cross Camden Road and then ride south on up Royal College Street. We believe that contraflow cycling from the canal exit in Baynes Street to Georgiana Street would be very worthwhile. Camden Council has been attempting to provide a local west-east route from West Hampstead via Swiss Cottage and Primrose Hill to Goodsway. They work on sections of this route from time to time when funding becomes available. We studied two of the links: Plender Street and Park Village East. The western end of Plender Street is one way eastbound (see photo on left). 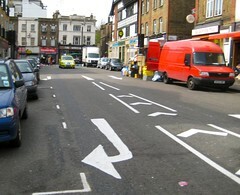 Contraflow cycling should be provided between Bayham Street and Camden High Street. The route continues in the tiny cobbled Miller Street on the other side of Camden High Street (see photo on right). After Miller Street, the local route follows Mornington Street and Park Village East. 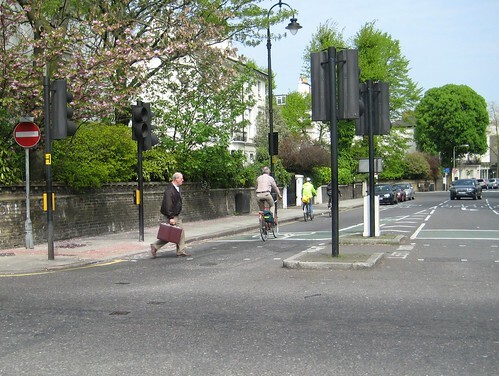 The latter is currently one way southbound, but Camden has already consulted on a scheme for two way cycling, which we hope will be put in soon. 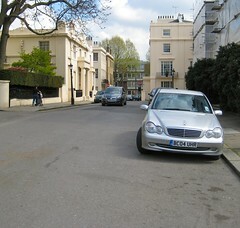 The route continues towards Primrose Hill via Gloucester Avenue. 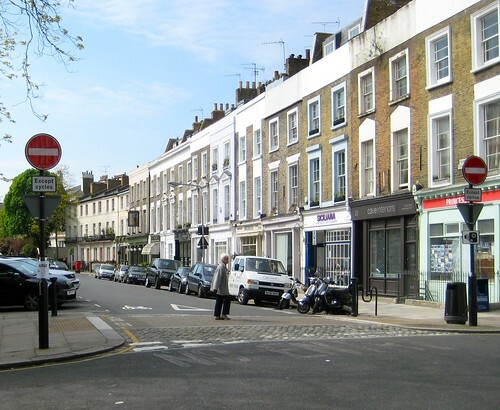 We rode through Regents Park Estate, up Albany Street and then turned into Chester Gate towards the Outer Circle. This works fine westbound, but the reverse isn’t allowed – Chester Gate is one way westbound (see photo on left). There is plenty of room for contraflow cycling except in the short stretch on the approach to Albany Street. This road is managed by Crown Estate Paving Commission who don’t reply to letters, so is very difficult to get anywhere with this idea. We returned to the Honest Sausage on the Broadwalk for a lunch sitting out in the sun.